We are based in Honiton, East Devon, Southwest England and spend our lives running through some of the most beautiful countryside in the UK. Several Honiton Running Club members braved the heavy rain on Sunday morning to take part in the Dalwood Fair 10k multi-terrain run. The rain did stop about an hour before the race and held off for about 20 minutes of runners setting off. It wasn’t too cold but rain earlier in the week, together with rain on the day, made for very slippery conditions. First back for Honiton was young Flo Swan who continues to show everyone else how it should be done. She was 7th overall and 1st lady. Steve Selley had a great run coming 17th in exactly 49 minutes. Howard Bidmead had his run of the year coming just 2 places later in 49:39. He showed Steve Davey a clean pair of heels early on in the race with Steve coming 24th in 51:20. There was a bit of a gap but Mark Dallyn came 25th in 52:18 having also had a great run. David Hawker came 33rd in 54:32 having overtaken Judy Davey as she had just picked herself up from falling off a stile. Judy came 35th in 55:34. Linda Pike wasn’t too far behind coming 39th in 1:00:38. Claire Rouse is enjoying racing for the club and tackled this one for the first time to come 45th in 1:04:41. It was good to see Claire Burrough racing for the club again coming 49th in 1:07:00. The line-up was completed by Carol Turnham who enjoyed the race coming 55th in 1:14:42. The race was won by James Reeves in 39:20 and there were 56 finishers. Thanks to Dalwood Run Committee for putting on the event and Axe Valley Runners for assisting but thanks must go mostly to the marshals who stood or sat in the pouring rain for far too long. Firstly I would like to thank everyone who turned out for the record breaking July handicap. We had 32 runners appear for this month’s run and it was all the better for it. The previous best over the last two years was 21, not sure how we can beat that next month but we will try. A beautiful evening met the hordes of runners and once I saw the number growing and growing I did think “what have I done”? John Burgess was quick to settle our nerves by stating we had a 50% greater chance to muck up the result with this many people. We continued to get names and set the times and slotted in the 10 new runners. When the runners set off we knew that a few of the new runners would be released at the wrong time. But it was still a surprise when Tom Willey came belting round the corner to the finish with no other runners in sight, 2 minutes ahead of the field in 22:05. Being this was Tom’s first run he was not eligible for the monthly prize but Sally Willey (his wife) was next, in a great time and a PB of 23:49 taking 1:42 of her previous time, at least Tom can see the prize at home! 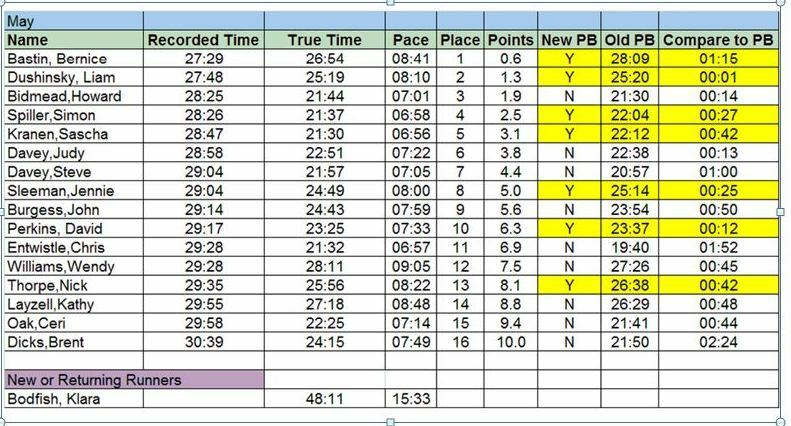 There were also some other great PB’s and some good new runner times, the first 7 all had PB’s apart from Howard, our thorn between two roses. Unfortunately the timing was faultless so there were no huge muck ups to talk about but there is always next month. Thanks to Claire, JoJo and Suzanne for recording and John Burgess for the words of wisdom. 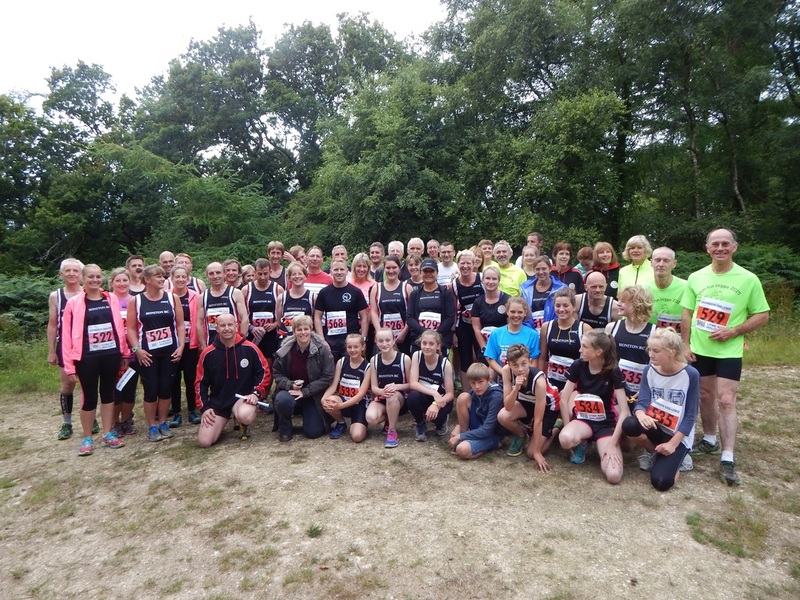 On Monday, 12th July Morganhayes Woods was inundated with runners of all ages. They were taking part in the Woodland Relays organised this time by Axe Valley Runners. It is a fun event fiercely challenged by AVR, Honiton Running Club, N1 Tri Club, Met Office, Exmouth Harriers and Sidmouth Running Club with some very fast Upottery Primary School children in attendance too. No matter what age the participant is, everyone runs in relay teams of three tackling the 3k hilly route of muddy tracks designed by Garry Parrett. The overall winning team was the Livingstone family in the very speedy time of 36 minutes 58 seconds. The first Honiton team home were the Honiton men finishing 3rd overall in 40:01 and made up of Kevin Hawker, Karl Hodson and Steve Selley. The Honiton Junior Girls were next back coming 6th overall and not only winning the prize for 1st U17 girls but were also 1st female team home overall. They took 44:35 and were made up of Flo Swan, Morgan Davy and Jasmine Stone. Jasmine challenged Alasdair Moffett to the line and he made up Honiton’s next team home in 44:39. That team took the mixed adults prize and was made up of Suzanne Spiller, Judy Davey and Alasdair. Honiton’s mixed junior team also had success winning their category to finish 11th overall and 46:16. It was great to see so many teams out with Honiton making up 17 of them out of the 35. Thanks to Garry Parrett and the rest of AVR for another great Woodland Relay. A warm muggy evening on Dartmoor saw 250 runners taking part in the 30th Haytor Heller. This is an extremely tough 6 mile event which starts halfway up Haytor which runners have to ascend before setting off across the moor where they climb Hound Tor at the half way point before returning to Haytor which they climb once more before a fast descent to the finish below. Ian Stewart had a great race for Honiton finishing in 46:30 and finishing 13th overall. Howard Bidmead was next having had a good run in 58:25 in 93rd place. Louise Crisp completed the Honiton team and finished strongly in 61m coming in 116th. The race was won by Aaron Tocknell from Torbay in 41.09. A record number of runners took part in the Otter Rail and River Run last Saturday which starts and finishes in Tipton St John. It is organised by Tipton Playing Field Committee and Sidmouth Running Club and is a 10k route which is almost as flat as it gets in East Devon. 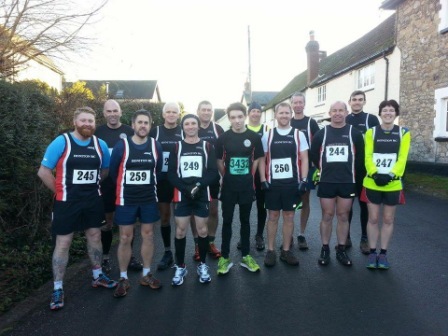 Karl Hodson led Honiton Running Club home to finish 23rd in 41 minutes 55 seconds. He was followed by Steve Davey who finished 41st in 44.26 with Steve Selley hot on his heels; 5 places and 21 seconds later. Mark Dallyn struggled with this race finishing 63rd in 47.30. Mark Andow came 86th in 50.24 and Jim Hill was 105th in 53.26. Kathy Layzell and Sandra Thorpe finished together in 152nd place in 1:00:36 and Michelle Selley who has just started running again after injury completed the line up to come 179th in 1.05.09. James Denne won the race in a new course record of 34:33 and there were 215 finishers; an increase of 50% on last year. Damp and warm conditions greeted the 100 runners that took part in Sunday's Bridport 10k. This tough off road event takes in the Jurassic coast path and due to fog on Thorncombe Beacon the Coastguard had advised the route be diverted at this point. This did not detract from what was a stunning run and by the time the runners reached Thorncombe the weather was clear.Two Honiton runners made the trip. Howard Bidmead had another good run in an event he enjoys and finished in 51m 07s. Paula Ferris running in a Honiton vest for the first time enjoyed her run and was beaming when she crossed the line in 61m. 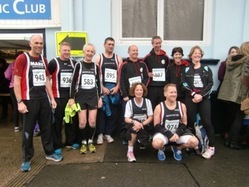 On Sunday, 30th June, four Honiton Running Club members took part in the Torbay Half Marathon at Paignton. This is a two lap route and takes in stunning coastal views across Torbay. Steve Selley had a great race even though it was hillier than he had anticipated. He came 172nd in the fantastic time of 1 hour 35 minutes. David Perkins, sporting his Honiton vest for the first time, was next back coming 602nd in 1:51. The ladies of the Club followed in the form of Katy Campbell who came 783rd in 1:57 and Kathy Layzell who came 1020th in 2:06. The race was won by Jonah Cheshum in the time of 1:09. Six Honiton runners went to Charmouth last Saturday to take part in the Charmouth Challenge organised by Charmouth Primary School. The weather was a little too hot for racing although runners did feel the benefit of a cooling breeze on some of the descents. The race is the most southerly fell race in the country and includes two steep and long climbs. The first is within the first mile climbing the infamous Stone Barrow Lane and later on in the race runners climb up Golden Cap, the highest point on the South Coast at 191m. It’s all worthwhile though as racers are treated to the breathtaking views of the Jurassic Coast. The winner was Jamie Parkinson in the amazing time of 50:32. Honiton’s first runner home was Steve Davey who came 53rd in 1:10. Howard Bidmead knocked minutes off last year’s time coming 65th in 1:12 and he was followed by Mark Dallyn who also had a great run to come 68th in 1:13. Judy Davey was pleased to come 80th in 1:16 just ahead of first timer for the race Tim Wigram who finished 87th in 1:17. Nicola Greenland is relatively new to HRC and this was a brave race to tackle. She finished 164th in 1:29. There were 231 finishers. Sam Dowson and his brother Archie tackled the fun run of 1.8 miles. Sam did amazingly well to come 4th overall just 15 seconds behind Mathew Lissenburg who won the race. Archie is showing incredible form for his age and came 11th in 13:43. There were 151 finishers in this race. 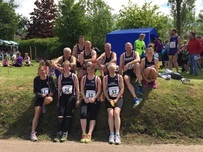 Honiton Running Club members took part in the Over the Hill and Farway 10k organised by Farway Primary School on 21st June. The figure of eight loop includes a little climb up WarrenF Hill which has a total climb of 432 feet. This is completed within the first 3k of the race and the first male and female to the top are awarded a very well deserved prize for King and Queen of the Hill. King of the Hill was awarded to the race winner a very fast young runner with a great running future ahead of him; Jake Smith in 37 minutes 6 seconds. The Queen of the hill was a closer fought tussle between Honiton’s Suzanne Spiller and Florence Swan. Flo and Suzanne were neck and neck for most of the hill, friendly words of encouragement were exchanged for most of the hill but someone had to win, eventually experience prevailed over youth and Suzanne crested the hill first. Once at the top and on flatter ground Flo passed Suzanne and she slowly pulled away and was first female in a fantastic time of 45:41. The race was well represented by Honiton Runners, 18 in total young and old (you can choose which category they fall in). Ben Stone was first back for Honiton and although he had a chest infection still managed a time of 43:00 he finished 4th overall. 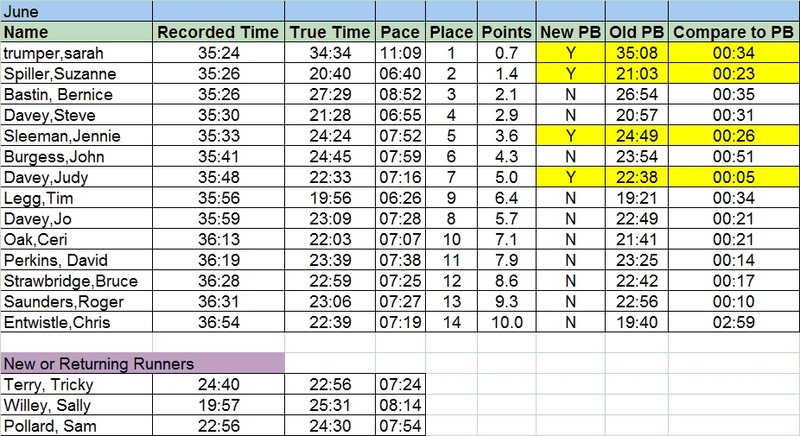 Flo was next home for Honiton finishing in 8th with Suzanne not far behind, finishing 24 seconds later in 9th place. Hadleigh Davies started well and finished in a respectable time of 47:09 despite aggravating his calf injury in the process. Richard Harris whipped up the hill and eventually finished 10th in 47:23. Vernon Gillard was next back in 13th and is starting to find his stride again and finished in 49:35, Bruce Strawbridge followed behind Vernon in 14th with a time of 50:04. Bernice Bastin completed the Honiton group racing this hard run for the first time and finishing in 35th in 64:12. There were 40 runners. Thanks to the marshals and organisers for a fun great event. The Honiton young guns we also out in force to run the fun run and the junior race. Jasmine Stone was the first female on the junior race and finished in a very speedy time of 17:40, watch out Flo and Suzanne in the future. The junior run was won by Cameron Bryson in 16:57. The fun run was an exciting run along the river and back into the hall and many families from the club took part including Harrison Stone, Ben and Charlie Entwistle, Douglas, Bebe and Freddie Wigram and Max and Ella Spiller. 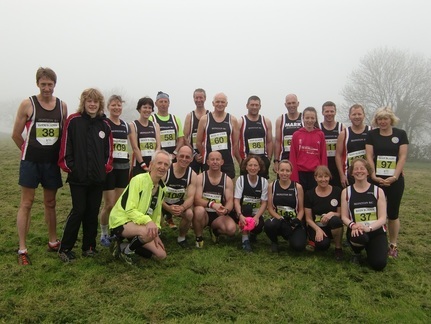 Honiton Running Club’s own Blackdown Beauty took place last Saturday around the Blackdown Hills’ countryside. Weather conditions were perfect. The main routes were either 18 miles or 10 miles although there were other options. The base was at Priors Park Farm, Culmhead. The long route took in 4 pubs as well as a cream tea taking runners to Pitminster and then on to Clayhidon before a visit to Pear Tree Cottage, Stapley for the delicious cream tea, appreciated by all. Thank you to the Parry family for the use of their gorgeous garden and all the ladies of Smeatharpe WI for making the scones and serving welcome cups of tea. Once fed and watered, runners went on to Churchinford before running back to base. Thanks to everyone who helped in any way but especially Jim Hill and family for giving up part of the farm for the day by providing the ideal base for the run including a barn for the post race barbecue. 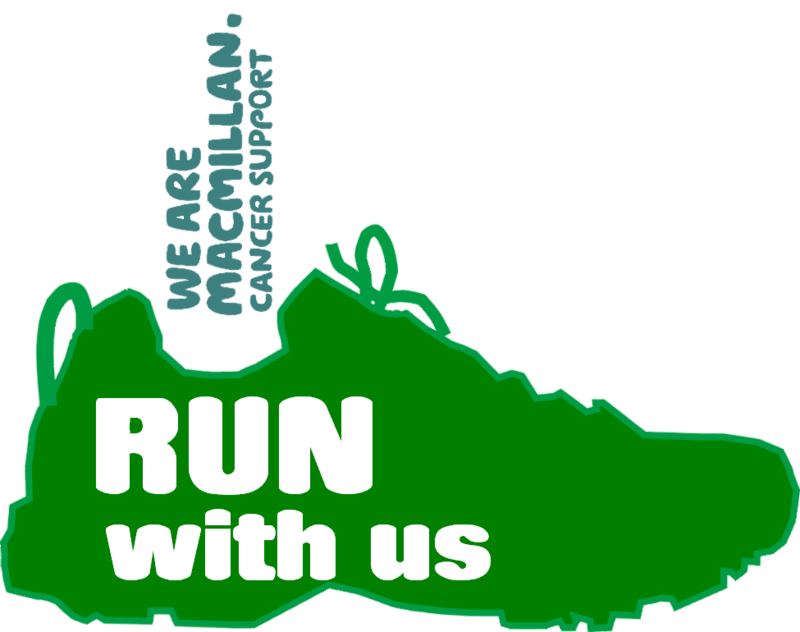 All money raised goes to Macmillan Cancer Support. Keep an eye on the website www.honitonrc.com for the winter version - The Blackdown Beast due to be held in January. The other HRC members took the much more sensible option of tackling the half which boasts more than half of the 3500 ft of climb to be found in the full marathon. Steve Davey was first back coming 111th in 2 hours 2 minutes. He really does need to return next year and complete it in under 2 hours! Howard Bidmead was next back finishing 168th in 2:11 followed by the first of the ladies; Jennie Sleeman who finished 292nd in 2:27. Denis Costello was next back coming 389th in 2:40 and then came Clare Melbourne and Juliet Hall who had run together to finish 506th in 3:09. Great results especially considering there were around 900 entrants. Great races, well organised and in a fantastic location. Thanks to Wendy Le Masurier who had organised what proved to be a fantastic trip which saw the group meeting up for a post run meal in the local pub! Stephen Boyes didn’t travel quite as far for his race last weekend, only to Cheltenham but he made up for it by running almost twice as far as even the marathon runners in Wales. He took part in the Cheltenham Ultra 48.4 miles completing it in 9 hours 42 minutes. Stephen started to think he would be running forever having taken that long but full credit to him for completing it. As some of you maybe aware I do make the odd mistake with the timings for the Handicap from time to time. Well tonight was no exception, it may be due to me trying to give the evening a carnival feel which encourages and relaxes all who turn up or that I really am just that stupid….. I will leave you all to decide that one. Anyway there was a great turn out with about 23 of Honiton running club's finest and Bruce ready for the occasion. Not all wanted to be timed but it was nice to have so many there. The sun was out and the mood was fun with Hadleigh handing out sweets before the run. What could go wrong on a glorious night like this with Haleigh and myself in charge! Well it all did...... First of all I managed to set poor Jo off at the right time then call her back then realise she should have gone and then set her of again.....great start for Jo. Then I told Suzanne and Chris that I would give a 2 minutes warning, of course I forgot and poor Chris was watering the hedge when we shouted "Chris 5 seconds"... Suzanne was unfortunately 100 yards the wrong way up the road when we shouted 10 seconds needless to say she was not happy with me.... luckily we had young Harry Entwistle with us so the words were a little tamer than they could have been. Once they were all away Hadleigh and I decided to prepare for the returning runners. We did this by eating sweets and chatting about random rubbish. Not at any point did I think to tell him what to do when runners come around the corner with the strange large calculator thing in his hands. So tonights run was very close and the handicap system worked extremely well, too well for rookie Hadleigh and relaxed Spiller. New runner Sally came around the corner first in a great first time effort then followed by this months winner Sara. Very shortly after this it felt like 50 runners came across the line. Anyway as the panic set in my mind went blank and I forgot half the names of the people and made a horrid mess of writing them down. I recovered and managed to get the last half of the names accurately hoping that if I ask the helpful bunch of HRC runners they would support and tell me where they came. Unfortunately my desperation quickly descended into extreme panic as I also discovered that Hadleigh had only recorded a time when each group came in not for each person...ahhhh how would I recover this disaster, again I thought I would ask the group for help, well you can guess what I got back from them. Anyway some great member of the club could see the panic in my eyes and gave me some of their times and we managed to pull together the results. There was some great running and some good times amongst the chaos and I think every one enjoyed it. Until next time. A Summer's evening at Branscombe! part of our Weston Cliff Path run on Monday, 1st June. Last Saturday, at midday, the hottest part of the day, 68 runners gathered to take part in the new route of this year’s Talaton Trotter which had been shortened to 8k. The race was won by Simon Minting of Exeter Harriers in the time of 28 minutes 10 seconds. The ladies for Honiton showed the men how it was done with 15 year old Flo Swan leading Honiton home to come in 8th overall and 1st lady in the incredible time of 32:50. She was followed by Honiton’s next lady Suzanne Spiller who was 2nd lady overall in 10th place in a time of 33:45. Steve Davey was the first Honiton man home finishing 17th in 35:03 with Howard Bidmead hot on his heels just 18 seconds later. Mark Dallyn followed coming 22nd in 36:26 with Bruce Strawbridge finishing 26th in 37:19. This was the first race Vernon Gillard had taken part in almost a year and he came 28th in 37:44. Linda Pike finished 41st in 43:08 and Bernice Bastin followed finishing 54th in 46:58. Rachel Horwood followed 2 places later in 47:51 and Kathy Layzell came in right behind her in 48:15. There were 68 finishers. The Weaner is a shorter version of 3k and Joe Swan did very well to finish 4th overall with 14 finishers. Runners were greeted back by cheers from a fantastic crowd and a delicious Talaton Trotter cake. Many thanks to Robin Carter and helpers for organising this event. See the flyer below for further information. Beginning on 24th May, The Forces March 5 Ultra-Marathons in 5 Days took place and it was the sixth time the Veterans’ Charity had organised the event. It starts in Ilfracombe and passes through glorious countryside in Exmoor, the Quantock Hills, rural Somerset and much of Salisbury Plain finishing in Bulford, Wiltshire. 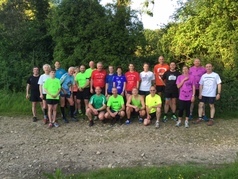 Honiton Running Club’s Stephen Boyes together with his mates at Axe Valley Runners, Steve Reynolds and Geoff Woodward, completed the 137 miles over the 5 days . Stephen was delighted to finish in 6th place in under 25 hours. 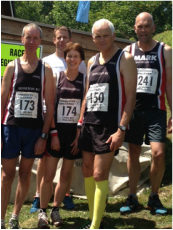 Last Saturday 4 Honiton RC members took part in the 10th anniversary running of the Umborne Ug which is a tough multi-terrain 10k race. The weather was perfect with the forecast being quite specific about raining at 7pm. With the race starting at 6pm, this allowed enough time for most competitors to have returned back to Umborne Village Hall for cakes and a barbecue before the promised rain came albeit an hour late! James Denne won the race in an all time record of 39 minutes and 1 second. Steve Davey and Richard Harris had a great battle to the finish line with Steve being the ultimate victor to finish 17th in 51:05 with Richard 1 second behind. Steve won his age category prize much to the dismay of Richard who is in the same category! Howard Bidmead had a great run and thoroughly enjoyed it coming 34th in 54:24. Judy Davey was the sole Honiton lady finishing 45th in 57:24. There were 91 finishers. Thanks to the landowners, marshals, AVR members and anyone else who helped with organisation but especially Rick and Eleanor Wood. Money raised goes to the upkeep of Umborne Village Hall. On Sunday, Julie Payne went up to Edinburgh to support her friend and took part in the Edinburgh Half Marathon. Julie enjoyed racing on the road again and thought it was a great race. She managed the fantastic finishing time of 1 hour 36 minutes. May Handicap - Well done Bernice! This month's winner. Congratulations and well done to everyone who took part in the Ottery 10k today. Provisional results are here. The Ottery 10k race was back this year for the first time in 3 years. This year Honiton Running Club took over organisation enlisting the help of former organisers. Ottery Carnival Committee provided many of the marshals on the day and there was plenty of help from other sources such as young Sports Leaders from King’s School. The course is all on road around the streets of Ottery St Mary and fairly flat so good for those with an eye on a personal best time. The race was won by James Denne who led the field from the start to finish in 32 minutes 26 seconds nearly two minutes ahead of the 2nd man back, Kevin Squibb of Tiverton Harriers. James races a lot which makes it extra special that he achieved a pb for the distance. Another Tiverton Harrier was first lady back in the form of Serane Stone who finished 15th overall in 38:08. Cathy Newman of Exmouth Harriers was 2nd lady home coming 1 second under 40 minutes. 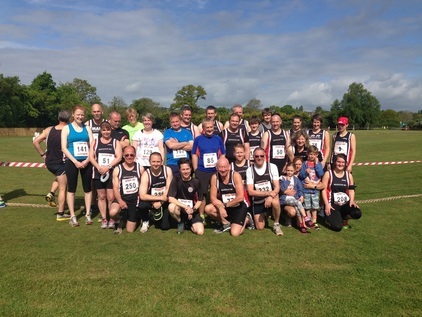 Many Honiton runners were helping with the event but the club still managed to put up a good show. Young Kyle Hartnell was first back coming 18th in 38:33. Jack Cooper had a great run coming 30th in 41:41 followed just 2 seconds later by another youngster, Will Daly. Hadleigh Davies followed coming 34th in 42:04 and next back was the first Honiton lady, Suzanne Spiller who won her category to finish 38th in 42:39. Adam Hennessey was running for Honiton for the first time and came 44th in 42:58. Stephen Boyes came 48th in 44:23 and Richard Harris 52nd in 44:33. New Honiton runner, Sherrie Hair, did really well finishing 58th in 45:12. Tom Bornet followed coming 62nd in 45:45, Mark Dallyn 65th in 45:57 and Paul Williams 72nd in 46:27. Jo Davey hasn’t raced for a couple of years but tackled this local race to come 82nd in 48:11. Mark Andow had used Jo as a pace maker for the entire race and finished just 1 second behind her. Next came Pippa Westall 98th in 49:18 and Brent Dicks 105th in 50:07. Jay Sweetman was racing for Honiton for the first time and his rapid improvement recently meant a 107th finish in 50:18. Tony Peek followed in 129th place in53:03, John Burgess 141st in 54:45, Phil Hall 156th in 55:55 and Liam Dushynsky 157th in 56:03. Jonathan Willis has been taking part in Tony Peek’s training programme of 5k to 10k and finished 166th in 56:52. HRC President Alan Rowe MBE finished 173rd in 57:46 and Matt Phillips another 5k to 10ker finished 176th in 58:09. Jo Jo Davey finished just 5 seconds ahead of Sam Shute in 189th place in 59:44, both pleased to have finished under the hour. Bernice Bastin came 195th in 1:00:44 and Dawn Peek 201st in 1:01:56. It was Wendy Le Masurier’s first race since having baby Harry in October so she was delighted to finish 203rd in 1:02:23. Sara Trumper was 229th in 1:17:30 and completing the Honiton line-up was Gillian Summers and Emily Westlake who kept each other company throughout the race to finish 232nd in 1:36:17. Huge thanks to all the sponsors, the Cricket Club, the Carnival Club and anyone else who made the day such a success. The previous Sunday saw a great turn out of HRC for the Beer Blazer which takes in some of the toughest Grizzly terrain including the length of Branscombe Beach and the infamous Stairway to Heaven. Tim Lenton won the event for AVR in 45:17 and in 2nd place was Honiton’s own Kevin Hawker in 46:37. HRC also took 3rd place with Ian Stewart 9 seconds later. Other Honiton runners were: 20th Hadleigh Davies 54:39, 22nd Richard Harris 54:47, 24th Steve Davey 55:44, 27th Bruce Strawbridge 57:38, 29th Mark Dallyn 58:06, 31st Howard Bidmead 58:20, 34th Paul Williams 58:53, 39th Judy Davey 1:00:16, 42nd Louise Crisp 1:01:04, 48th Roger Saunders 1:02:27, 65th Jim Hill 1:06:06, 66th Pippa Westall 1:06:21, 70th Linda Pike 1:08:30, 72nd Jennie Sleeman 1:10:02, 86th Kathy Layzell 1:15:33, 91st Carol Turnham 1:17:19. There were 114 finishers. HRC also had success in the Beer Blazer 5k as Thomas Lilley was 3rd male in 26:36 and Katelyn Wells was 3rd female in 8th place overall in 28:06. The race was won by Oliver Rodger of AVR and there were 34 finishers. On Sunday, 3rd May, three Honiton runners, Paul Williams, Dawn Peek & Tony Peek travelled to Crediton for the Crediton Crunch. It was a new route this year with 2 hills and a king & Queen of the hill! Paul was coming back to running and not fully fit, whilst Tony was there to run with Dawn as a mentor. According to the weather report it should have been an overcast but dry run, making for a nice run. The race started at 10.30am – 10.33am and the heavens opened with a downpour that lasted for about 5 minutes. The run itself starts in the rugby fields before winding its way around the football fields , then out into the country, with very little road, which is all flat to start with. Then runners reach the first hill at about 2 miles which is steep although not the longest of the two, they then run steadily downhill through lovely countryside meaning runners have to go uphill for the next mile climbing through fields. Just when runners think there can’t be any more hill they turn the corner, go up a few steps and then run right through the middle of a maize field in full bloom. It is a really well organised run with lots of marshals on route with friendly faces and words of encouragement. Paul did fantastically to finish 44th in a time of 51 mins, Dawn found this a hard race but was pleased to have completed it in a time of 1hr 13 mins, coming in 163rd together with Tony. There were 180 runners and first back was Kevin Squibb of Tiverton Harriers in a great time of 38;51. 1st female back was Ellie Sutcliffe of South West Road Runners in 45;52.There was a goody bag for all finishers and lots of drinks and cake for after the race. 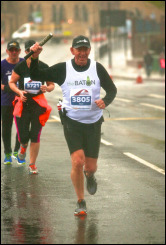 Honiton RC’s president, Alan Rowe MBE, took part in the Sunderland Half Marathon on the same day. It was a tough one and the weather atrocious with torrential rain and a biting gale that nearly took Alan’s feet from under him several times along the sea front. Alan ran as he often does with the Baton and a waist pack with leaflets containing the Baton’s Message of Conscience. As usual he stopped a few times along the way to talk about the Baton's significance and as it was his first run on the road since last October he was very pleased to finish in a time of 2:18:41. Legendary Run Commentator Brian Porter stood for ages in awful conditions to see the runners home and to Alan’s surprise gave The Baton tremendous respect by carrying it the last 150 metres with him, explaining its history to all at the Stadium of Light as they approached the line. Alan felt very proud when Brian asked to have a photo holding the Baton after the run. Paul Williams was out again last Saturday taking part in the Ivybridge 10k which is home territory for him. Paul had a great race coming 186th in 46:54 out of a field of 698 finishers. This is a road race but not without its hills. It was won by Ceri Rees in the almost unbelievable time of 33 minutes 3 seconds! On Saturday 16th May 2015 we are getting married in Holcombe Rogus Church. live music from "Party Starters"
As most of you know we were looking a long time for our dream house and a place to run our business. Having found that last year our long standing plans to Tie the knot after 18 years together all fell into place. Our evening wedding party will kick off at 7.30pm with the band ready to get the bride and groom on the dance floor just before 8pm. Five Honiton Running Club members lined up along with 37,000 other runners to take part in the 35th Virgin London Marathon on 26th April in weather that was perfect for runners but a bit on the chilly side for the many thousands of spectators. Hadleigh Davies was the first Honiton runner home coming 5297th in a time of 3 hours 25 minutes. Like most people he had a great race until the last few miles when he slowed up considerably. He was followed less than 3 minutes later by Judy Davey who finished 5918th in 3:28 delighted to break the 3 ½ hour barrier for the first time in 5 years. Hadleigh and Judy have taken part in several London Marathons before but it was the first time for the other Honiton members. Liam Dushynsky led this group home having only started running when his London place was confirmed. He did not have any idea how long it would take him but he had mentioned 5 hours. He was therefore delighted to beat the 4 ½ hour time by 2 minutes to come 21466th overall. Klara Bodfish was running for the Breast Cancer Campaign and had managed to raise over £2000. She found the atmosphere amazing and was emotional when she saw her family at mile 19. She struggled after 20 miles but talking to another runner encouraged them both to finish strong in 5 hours 3 minutes, just minutes over her goal. Kelly Allison had also raised a lot of money for her charity; Multiple Sclerosis Society for her cousin who has the disease. Kelly finished in 30492nd place in a time of 5:11. Ben Stone went one better than a marathon and took part in the Evesham Ultra consisting of 48 miles on the same day. He completed it in 7 hours 32 minutes coming an incredible 3rd place overall out of 70 entrants. He was 25 minutes behind the winner but just 5 minutes behind 2nd place. It was a tough hilly race in the Cotswolds with some beautiful views. Inevitably Ben found it hard and ended up with some blisters to be proud of but he had a strong steady race and is ready for his next challenge! A huge well done to everyone who took part in the Hippo and Hippo Calf. Honiton Running Club hopes you enjoyed the day. Provisional results are listed on this page and also on the Hippo page. Please email j.davey416@btinternet.com if you find a problem. Found property - black track suit bottoms and top. Honiton Running Club held its Hippo and Calf runs last Sunday with the base at Honiton Primary School. It was fabulous running weather albeit a little on the chilly side to start with. The main Honiton Hippo race is just over 7 miles in length involving plenty of variety. Runners first run down the road to the entrance of Combe Woods before circling the woods and coming back on the road to Combe Raleigh. They then face the challenging St Cyres’ Hill running on road and through woods. Next it’s down towards Awliscombe to be taken off road and into the Land Rover Experience only to go straight back up the hill again. A quick run around the Land Rover Experience follows involving several muddy soakings with a brand new water feature incorporated for the first time this year! This cleaned runners off a little before descending to the first river crossing before the climb through fields and eventually picking up the road back to the school. Just when runners thought they were nearly there, they were sent through a couple of fields before the main river crossing. Luckily a strapping fireman in the form of Warren Oak was there to lend a hand and pull out the runners. The race was won by James Denne in a course record of 46 minutes and 51 seconds and the first lady home was Gemma Collier who finished in 58:11. Many Honiton RC members were involved in helping or marshalling but quite a few took part with the first back being Alasdair Moffett who was 11th in 57:39. The next runner in for Honiton had an incredible race. Florence Swan came in 2nd lady overall picking up a trophy and a bottle of wine. However, as she is only 15, this was collected by her mum who was under instructions to swap it for a box of chocolates! Florence was 14th overall finishing in 59:22. Next was Hadleigh Davies whose run was a late decision and was a warm up for the London Marathon next week. Hadleigh came 17th in 1:00:24. Another youngster having a fantastic race was next in the form of Will Daly who came 19th in 1:00:44. Steve Selley was next back coming 21st in 1:01:06. He was followed directly behind by Suzanne Spiller in 1:01:24 finishing 3rd lady overall. Richard Harris had a fall but still managed 28th in 1:03:16. Tanita Retter didn’t quite know what she was letting herself in for with so much water but finished 41st in 1:07:02. Esme Moffett crossed the finish line covered in mud from head to foot achieving 49th place in 1:09:36. Despite having marathon legs from Paris last week, Stephen Boyes came 59th in 1:11:10. Shane Hudd thoroughly enjoyed the race coming 66th in 1:13:20. Jennie Sleeman usually marshals but decided to run coming 85th in 1:16:56. She was followed not too far behind by Sarah Warren who finished 88th in 1:17:43. Claire Burrough finished next in 101st place in 1:19:58. Jim Hill loved the whole race finishing 109th in 1:21:58. Morgan Davy was more than a little apprehensive but finished well in 111th place in 1:22:16. Bernice Bastin hasn’t been running long but did well to finish 122nd in 1:24:03 followed not too far behind by Clare Melbourne who came 125th in 1:24:10. Newish member Peter Bishop was next back just 4 seconds in front of Kathy Layzell. They came 127th and 128th respectively. This is a favourite of Pete Lyus and he came back in 170th place in 1:29:51 followed by Carol Turnham 3 places and 29 seconds later. Completing the line-up for Honiton were two ladies who knew what was coming as they had taken part in the pre run during training. Tracey Hailey and Sara Trumper ran together finishing 240th in 1:54:26. There were 264 finishers. The Calf is open to youngsters of 9 years and over and is approximately 1 ¾ miles in length. It follows the same route as the Hippo until coming out of Combe Woods when the Calf runners are sent back to base. As the weather has been kind recently, this year to the delight of some but horror of others, the Calf runners were sent back across the same river as the adults. The race was won by Toby Garrick in 11:23 and Meg Somers was 1st female coming 4th overall in 12:56. Honiton’s Thomas Lilley took 1st male U16 coming 5th in 13:16 and the U13 prize went to Sam Dowson, also a Honiton runner, who finished 6th in 13:18. Honiton had other trophy winners with Katelyn Wells coming 2nd female, 10th overall in 13:46 and Ashley Ford-Cosens who came first U16 female finishing 35th overall in 16:54. Other Honiton runners included Hannah Land, Olivia Daly and Eleanor Ducker with many others running for their primary school team including several for Upottery making up the team of the primary school cup winners for the 2nd year running.There were 64 finishers. Thanks to everyone for supporting the run and those who helped including marshals and cake makers and especially the land owners for allowing all those feet to trample their ground. Honiton’s next event is the Ottery 10k on 17th May. Visit www.honitonrc.com for more information. 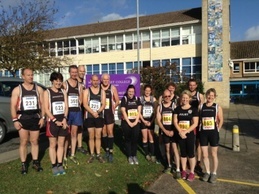 Last Sunday, Honiton runners took to the task of running the Taunton Half Marathon – an interesting route that started and finished at the Taunton College. The route went through the heart of the city with lots of people lining the streets and shouting support, then out along country lanes, through small picturesque villages before returning along the main Wellington road into Taunton with a cheeky little hill to climb at mile 11-12. Plenty of drink stations along the route as well as wet sponges helped runners to keep cool in the very warm conditions. The weather was sunny with a wind that sneaked up when runners went around a corner. Shane Hudd was running Taunton for the first time so was guaranteed a personal best time. He finished in 1 hour 53 minutes. Once again Tony Peek’s Achilles heel played up from mile 6 which made the uphill running very painful. He also stopped at mile 11 to give first aid to a fellow runner who had collapsed getting him into the recovery position whilst another lady phoned for an ambulance before leaving him in the capable hands of another first aider. Tony did well to finish under 2 hours in 1:58. With Klara Bodfish using this run as a training run for the London Marathon in a couple of weeks, she was looking to come in under 2:20 and she later reported that she had thoroughly enjoyed the race. She thanked people for cheering along the way which always puts a smile on her face. She particularly thanked Tony for the calming company as she said she had never felt so chilled before a race. Klara finished in 2:18. Stephen Boyes travelled a bit further to tackle a full marathon taking a plane to Paris. Stephen had a great run reporting it was the best marathon he had run in a long time. He recorded his heart rate throughout and managed to stick within his set limits meaning he was able to finish strong and did not have to walk at all. He was given a chip time of 3:38. 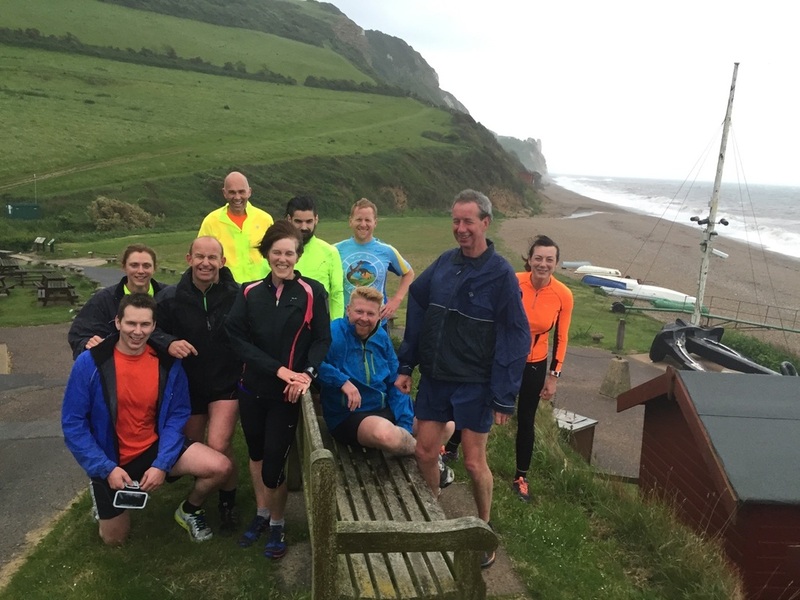 On Sunday 28th March Sidmouth Running Club held its infamous Exe to Axe run. This is approximately 21 miles of coastal running from Exmouth to Seaton. Elsewhere the wet and windy weather made for very unpleasant running conditions but not so for this race as the wind direction was actually in the runners’ favour blowing them along the way. The finish was very exciting with Axe Valley Runner Matt Clist and Ambleside AC Annie Conway battling it out for the winning position. Matt eventually crossed the line first in 2 hours 41 minutes and 41 seconds with Annie setting a new female course record finishing just 9 seconds later. First back for Honiton was Ian Stewart who came 53rd in 3:31:15 with Alasdair Moffett only 2 places and 20 seconds behind. Helen Davy had to pull out of the Grizzly at the last minute so decided to tackle this race instead. She came 187th in 5:06:54. Klara Bodfish has increased her mileage as she is training for London Marathon and she was delighted to finish in 5:11:50. There were 203 finishers. Good Friday saw the annual running of the Kilmington Kanter with money raised going to Kilmington Primary School. It was a pleasant day for a race although there was still plenty of mud on the ground. The race is nearly 7 miles of multi-terrain with the base at the Village Hall. The race starts with a steady climb and there is a pig of a hill around mile 5. Apart from that it is a good mix of road, fields and tracks. The race was won by James Green of local Axe Valley Runners in a time of 42 minutes 14 seconds. Hadleigh Davies was first back for Honiton coming 21st in 53:13. Steve Davey had followed him at some distance for much of the race but dropped off a bit to finish26th in 55:14. This is a favourite distance of Howard Bidmead and he had a great run coming 29th in 56:45 ahead of Judy Davey who was 39th in 1:00:57. Paul Williams had run with Judy for most of the race until rough terrain aggravated his calf causing him to slow down a little but he did well to finish just one place and 24 seconds behind her. Tricky Terry was happy with his run finishing 53rd in 1:06:33. This was Bernice Bastin’s first ever race and she did brilliantly to come 76th in 1:14:56. Following her efforts at the Exe to Axe last week, Klara Bodfish had a good race to come 81st in 1:16:10. Kathy Layzell hasn’t done much off road running recently so did very well coming 87th in 1:17:53. This was also Dawn Peek’s first race for the Club and she was encouraged the whole distance by her husband, Tony. They finished together in 92nd place in 1:20:34. There were 100 finishers. There was also the Fun Run on offer mainly for younger participants and this race was won by Arun Hawkes in 17:13. Honiton’s Flo Swan had a fantastic race coming 3rd overall and 1st female in exactly 18 minutes. Her brother, Joe, followed coming 10th in 22:45 in his first time out for the Club. Ashleigh Ford-Cosens and Eleanor Ducker ran together putting in gutsy runs finishing 18th in 28:35. There were 27 finishers. Runners were treated to a seasonal hot cross bun and a warming cup of tea upon their return of this well organised race. The Arlington Court Canter is a tough but beautiful scenic off road 10k race held on National Trust property in North Devon. Sunday, 22nd March was a perfect day for the race and with a week of fine weather the course was unusually dry and made for faster times than normal. Howard Bidmead, who is back racing again following injury, had a good run finishing in 48 minutes 40 seconds; a time he was really pleased with. On, Sunday, 29th March, a very wet, cold and windy day, Honiton runners took part in the Yeovil Half Marathon. Esme Wilson was first back having had a great run to come 166th in 1:39:20. Due to lack of time, Richard Harris hasn’t been able to put in the training he would have liked so was some way off his personal best time coming 313th in 1:47:29. Sara Trumper bravely tackled the distance for the first time and came 1024th in 2:43:38. There were 1062 finishers and the race was won by Rob Mctaggart of Bournemouth Athletic Club. 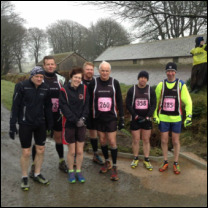 On the same day, even though the forecast was awful, 7 Honiton Running Club members and 2 supporters travelled to Simonsbath, Exmoor to take part in the inaugural running of the Run Exmoor 10 mile event. It is a challenging race organised by 3 keen runners and 1 not so keen runner who wanted to share their beloved Exmoor with likeminded enthusiasts. The race took runners through the most spectacular countryside that Exmoor has to offer; over beautiful moorland, farmland, through ancient woodland and along the River Barle. A race not for the faint hearted as a race on Exmoor wouldn't be complete without a few hills! Organisation was great; it was just a shame about the weather. The rain lashed horizontally and felt like someone was firing ball bearings at you! When it was a head wind, it was extremely hard to move forward rather than being blown where you had just been! Occasionally, the wind was behind giving runners a helping push up a hill. There were also a few places close to the river that actually felt sheltered although these were short lived. Participants could have been put off racing forever but runners are a hardy lot and doubtless they will return next year! The marshals deserve as much credit as the runners for managing to stand upright and even giving cheery encouragement as runners passed by. Karl Hodder was first back for Honiton finishing 13th in 1:28:09 and he was followed by Bruce Strawbridge who had overtaken Steve Davey in the final field on the run home. Bruce came 21st in 1:32:18 with Steve one place and 5 seconds behind. Next back was Honiton’s only lady, Judy Davey, who came 40th in 1:39:03. Howard Bidmead and Judy had changed position a few times throughout the race and at one stage ran together without another runner in sight for about 2 miles. Howard ended up one place and 28 seconds behind Judy. Although not planned, Tricky Terry and Tim Wigram ended up running most of the race together with one or the other just in front. Tim finished 54th in 1:49:52 and Tricky 63rd in 1:52:12. The race was won by Chris Gill and there were 113 finishers. Well a cold damp night set the tone for an almighty muck up with the timings (no bottle of wine for me next year). What I later discovered that evening was a simple transposition error of a formula had given some faster runners a “beginners” Handi cap. Which I am sure some would have been happy with as this may have given some their first win, luckily John and Suzanne were on hand try to fix the issue. Anyway this Special club supported and comforted me and encouraged me to do better next time…. (hold on, this is no fairy tale…). Back in reality they did what I would have done and enjoyed a laugh at my expense which kept them warm for a while. Unfortunately this quickly subsided and I soon became unpopular as everyone had to wait an extra 10 minutes in the cold while John and Suzanne worked out a rudimentary way of releasing the runners on December's Handicaps. Once the times were corrected the runners were advised of their times and we were ready to go. Im sure the 3 new runners were suitably impressed with the organisation and planning of this Great Club. Well if they weren’t then, they would be later when John still laughing at my mistake and merrily talking to others cried out GO GO GO as he realised he had forgotten to release some runners at their start time. A cry of “this muck lark is catching” from John rallied another round of warming laughter. Perhaps they didn’t notice? Anyway with the release times all a little out and only 12 runners it all seemed to be a very spread out run which lead to a less competitive race than normal. I think Steve and Tim didn’t see another runner. With the next Handi cap at Cotleigh I hope to see more of you fine runners out in the sun next month. 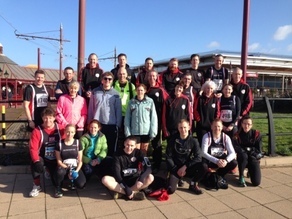 Ten Honiton Running Club members travelled to North Devon last Sunday to take part in the Bideford Half Marathon. Sold as a fast flat race runners reported a number of undulations as they left Bideford before returning on the pancake flat Tarka Trail. The weather in Honiton would have made for ideal conditions for running but not so in Bideford. The forecast was for rain and down it came! Once runners had set off it wasn’t too cold and the rain eased into a thick drizzle before hammering it down once again at the finish. Nevertheless, Hadleigh Davies had a great run finishing very close to his personal best time for the distance. He finished 90th in 1 hour 28 minutes and 47 seconds. Steve Davey was next back finishing 169th in 1:36:06 with Bruce Strawbridge hot on his heels having had a great run finishing in 178th place and just 18 seconds later. Judy Davey led the Honiton ladies home to come 248th in 1:40:09. Paul Williams found he still had Grizzly in his legs but did well to come 270th in 1:41:22. Mark Dallyn also had Grizzly legs and finished 305th in 1:43:18. Mark had to find a last minute burst of energy when he realised Roger Saunders was right behind him and that’s how they entered the finish funnel. Richard Tricky Terry found it tough even though he had lost the beard so was much more streamlined. He came 418th in 1:51:06. Jenny Sleeman put in another great half marathon finishing at about the same time as she always does in 1:52:57 and 440th place. Newly crowned female runner of the year for the Club, Kathy Layzell, did herself proud gaining a pb to come 683rd in 2:07:53. The race was won by Shaun Antell in the amazing time of 1:10:50 and there were 849 finishers. Most of the Honiton runners had completed the Grizzly last week but reported that they found this flat road race much tougher for very different reasons. 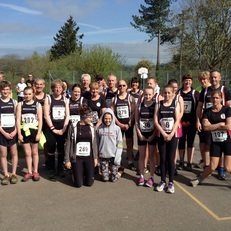 Honiton Running Club had a fantastic turnout for local Axe Valley Runners’ Grizzly and Cub runs last Sunday. The forecast was not brilliant and heavy rain was expected for about 1pm. However, the weather was perfect until about 3pm allowing most of the runners to finish and the marshals to step down before the rain set in. Runners found it extremely windy once they had reached the top of the infamous Stairway to Heaven but the unpleasant conditions were short lived as runners only run a very short way along the coast path before heading inland to Beer Head Caravan Park meaning that the wind was blowing behind runners actually helping them on their way. Ian Stewart led the Honiton runners home for the nearly 20 mile Grizzly coming an incredible 45th place in 2:51 followed by Ben Stone who came 98th in exactly the same time as last year – just within 3 hours. Karl Hodson followed in 125th place in 3:04. Hadleigh Davies had a great run coming 152nd in 3:10 followed by Steve Davey in 229th place in 3:18. Julie Payne led the ladies home to come 242nd in 3:19 a fantastic effort for her first Grizzly. Tom Bornet came 255th in 3:20 followed 4 places and 1 minute later by Judy Davey. Paul Williams only secured his Grizzly place 2 weeks before the event and did well to come 310th in 3:26. Mark Dallyn came exactly 400th in 3:34. Suzanne Spiller was next back coming 414th in 3:36 ahead of Steve Selley who struggled from the half way mark. Steve was 430th in 3:37. Jack Cooper only got his place 2 days earlier so was pleased to come 438th in 3:38. Julian Gigg was next in 451st place in 3:39 and Simon Spiller who had run with his wife Suzanne for most of the race came 542nd in 3:45. Louise Crisp was next back in 599th place in 3:49 followed by Richard Tricky Terry who came 661st in 3:53 for his first attempt. Alasdair and Esme Moffett who had run together came home in 703rd place in 3:56. Lyn Pike stormed round the course to come 843rd in 4:09 ahead of Howard Bidmead who has been dogged by injury. He finished 867th in 4:11. Shane and Michaela Hudd also ran together finishing 880th in 4:13. It was David Hawker's first attempt and it was a painful experience but he finished in 982nd place in 4:20. Tony Peek followed in 1008th place in 4:21 and he was followed some time later by Joe Daly who finished 1330th in 5:10 ahead of Sharon Wells by 5 places and 2 minutes. There were 1415 finishers and the race was won by Ceri Rees in 2:17. Some runners took the shorter option of the Cub. This is about 9 miles but is not to be underestimated. Mark Andow led Honiton home coming 45th in 1:32 and he was followed by Katy Campbell who came 63rd in 1:37. Sarah Warren was not too far behind in 74th place in 1:38. Alan Nichols now lives in Wales but took the trip to Seaton finishing 142nd in 1:48. Denis Costello had a good run to come 174th in 1:52. 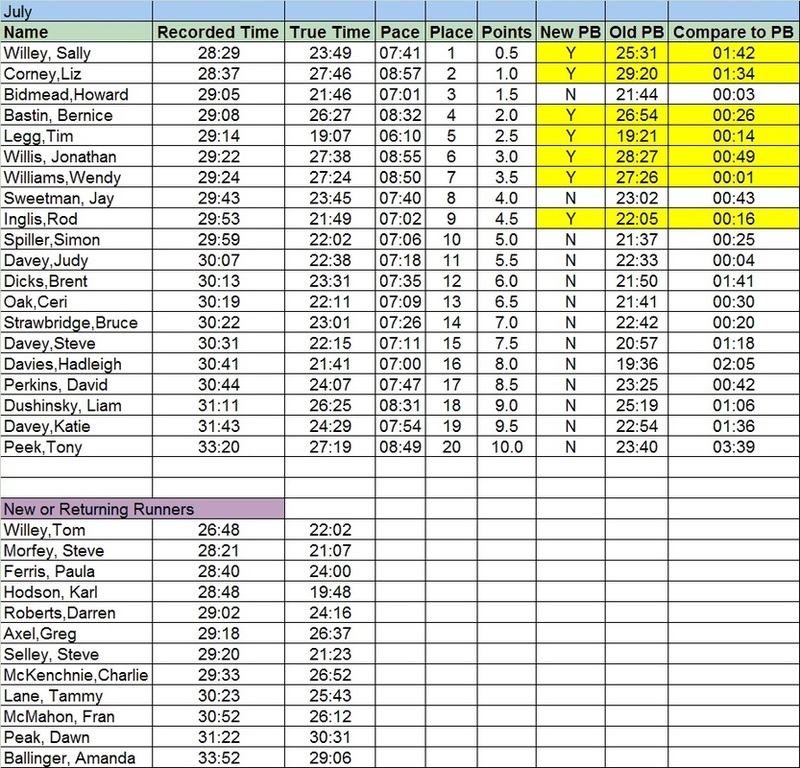 Charlotte Boyes did well to come 248th in 2:02 and Val Hales came 316th in 2:09. Pete Lyus ran with his daughter, Jo Taylor, and finished 343rd in 2:14. The Honiton line-up was completed by Sara Trumper, Tracey Hailey and Jo Lowman who all ran together finishing 410th in 2:30. There were 446 finishers and the race was won by Justin Ashby in 1:06. The day before saw the running of the Junior Run and the Fun Run. Honiton’s Thomas Lilley took part in the junior event running well to finish 16th in 18 minutes 55 seconds . The race was won by AVR’s Ollie Caute in the great time of 15:02. There were 44 finishers. Some of the club members youngsters took part in the fun run with Abigail Davies leading them back to come 99th in 12:49 followed by Max Spiller in 120th place in 13:32 and followed by his sister Ella who finished 165th in 16:07. There were an amazing 174 runners and the race was won by Jacob Hale of Seaton Primary School. Thanks to AVR for another fantastic Grizzly; brilliantly organised as usual with plenty of local support en route. Thanks to the many marshals providing encouragement and much needed sustenance in the form of flap jack and jelly babies along the way. Thanks also to the landowners, sponsors and anyone else involved. 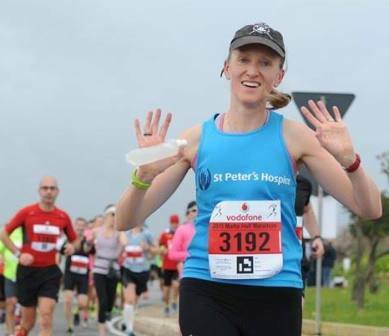 Katy Campbell ran the Malta half marathon on Sunday 23rd February for the third year in a row. The expected sunshine was replaced by heavy rain and large puddles, but the downhill course helped her take an unexpected 9 minutes off her PB. She was delighted to finish 43rd lady in 1:39:21. Most of the runners at last Sunday’s Dalwood 3 Hills’ Challenge were using it as last minute training for next week’s Grizzly but that didn’t mean they didn’t try their hardest! As it is one of the most local races for Honiton RC members, it wasn’t surprising that there was a good turnout for the Club. It was a cold frosty dry morning when runners set off from home but the rain started about half an hour before the race commenced and continued for the rest of the day gradually getting harder. Runners dressed for the chilly wet conditions but many wished they had chosen another layer. First home for Honiton was Ian Stewart who finished 8th in 1 hour 16 minutes and 45 seconds. Although an experienced runner, Karl Hodson has only recently joined the club and had a great race to finish 15th in 1:22:12. Next back was Steve Davey who managed to win his age category coming 23rd in 1:30:24. Bruce Strawbridge had a great race showing he is back on form tracking Steve around much of the course coming just 3 places and 28 seconds behind him. Mark Dallyn had a bit of a sore neck and was convinced he wasn’t going to run well so he was pleased to come 33rd in 1:34:55. First lady back for Honiton was Judy Davey coming 43rd in 1:40:37. Louise Crisp followed coming 49th in 1:44:10 and she was followed by Esme and Alasdair Moffett who ran the race together. They came 50th in 1:44:46. The Honiton contingent was completed by Lyn Pike who came 74th in 1:59:29 having thoroughly enjoyed the run. The race was won by Michael Robinson of Mud Crew Trail Runners in the fantastic time of 1:08:55 and there were 91 finishers. Also on offer was the Mini Challenge and Flo Swan took part in this coming 1st female and 3rd overall in a time of 26 minutes 23 seconds. This race was won by Jamie Barnett of Teignbridge Trotters in 25:32. There were 13 finishers. Runners returned to the welcoming warm village hall where homemade refreshments were on offer. Thanks to the Run Committee and everyone else who helped but the marshals deserve a special mention for braving the harsh elements for the morning. Helen Saunders who was in Paul and Jo's beginner runner group a year ago completed her first half marathon with Pacific Road Runners in Vancouver in 768 place out of 2084 in a time of 1:48:25. The weather was perfect. She's now hoping for snow to go skiing. The weather was perfect for this year’s Honiton Running Club’s Blackdown Beast; a little chilly but the sky was blue and the sun shone. There was a good amount of mud and other substances to sap the legs meaning the 16.3 miles were hard work. Runners were faced with a menacing looking bull in one of the fields but he turned out to be quite friendly and used to visitors on his patch! The Beast is always a sell out and this year saw a record number of 170 runners taking part with runners coming from all over Devon and some from further afield. The event is a social run with several stops on route taking in the scenery of the beautiful Blackdown Hills. The event began and ended at the Highfield Sport and Social Club, Dunkeswell. The first stop, after 7 ½ miles, was Smeatharpe Village Hall where participants were treated to delicious hot sweet mulled cider and equally delicious warming pasties. Thanks to the ladies of the WI for making and serving this very welcome sustenance. The next stop was the Sidmouth Arms, Upottery where some runners took the opportunity of taking a mini bus back to Dunkeswell having completed 10 miles. For others, it was on to the Luppitt Inn; one of the smallest pubs in the country! Organisers made sure the landlady knew runners were coming as opening times are flexible! The shortish last leg then takes runners across private land back to Dunkeswell. As always all participants thoroughly enjoyed the day with many looking forward to the summer version; the Blackdown Beauty. Places are likely to go fast for this event too so look out for further information on www.honitonrc.com and to register your interest very soon. Thanks to everyone who made the event possible including the landowners for allowing runners to churn up the already churned fields. Money raised totalled over £1000 once expenses have been paid and will go to Macmillan Cancer Support. Comments from the runners and photos of the day are here. Saturday 17th January saw the running of the Devon Schools Cross Country Championships at Stover School near Newton Abbott. 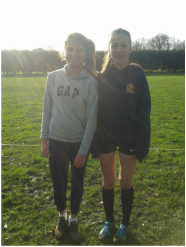 Two of the Honiton Running Club Junior Athletes had qualified to race: Kaitlin Wells and Sasha Davy. The distance for their age group was 3040m – just under 2 miles – which meant 2 laps of the short course. It was a predominantly flat or slightly ‘lumpy’ course and the going was muddy enough to make spikes a definite advantage. Both the HRC girls ran strongly, keeping a steady pace and gaining ground where they could. Kaitlin finished 14th and Sasha 16th respectively which was a great result for both of them in a very fast race. 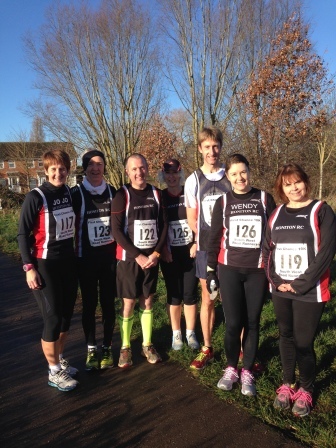 Axe Valley Runners’ Axmouth Challenge was well represented by Honiton Running Club members last Sunday. This multi-terrain race is 9 ½ miles of muddy fields and tracks as well as a fair amount of road and several hills. The race was won by AVR’s James Green in 58 minutes 9 seconds and first back for Honiton was Hadleigh Davies who came 14th in 1:12:20. Young Findlay Fuller was next back coming 19th in 1:14:39. Steve Davey had a great race coming 21st in 1:15:15 ahead of his rival Rod Inglis who finished 3 places later in 1:15:56. Mark Dallyn was the first back of a group of Honiton runners. Mark was 32nd in 1:17:45 directly followed by Bruce Strawbridge albeit 1 min 7 seconds later. Tom Bornet followed 2 places and 5 seconds later and the sole Honiton lady, Judy Davey, finished one place and 10 seconds behind him. A Honiton gap followed but Howard Bidmead finished next in 41st place and 1:21:18. David Hawker and Richard Terry were making their debut race for the club and ran together to finish 49th in 1:24:52. It was some achievement that they were brave enough to tackle it having been told countless times how tough the race was before the start! Jim Hill brought the Honiton contingency home to finish 76th in 1:34:55. There were 96 runners. Iain Ross took part in the 5 mile mini challenge coming 5th in 40:02. The race was won by AVR Jake Smith and there were 21 runners. Runners were treated to delicious warming soup upon their return to Axmouth Village Hall. Thanks to AVR for putting on the event, to all the supportive marshals, the soup and cake makers and the landowners for allowing the race to take place on their land. Bright sunshine and close to zero temperatures greeted the eleven HRC members who were looking for a flat 10K to start the year. The course is from the quay in Exeter and loops out to the Countess Weir Bridge twice. The race hosted by South West Road Runners is the first of the InStep Devon race series for 2015 and competitors earn points if they run 5 of these races. Over 500 runners finished with the first male being James Rodgers from N. Somerset and first lady Serane Stone from Tiverton Harriers. Kevin Hawker was a rather reluctant racer who really fancied the hills in the Axmouth Challenge, which others in the club were attempting, but was persuaded to run fast instead. He did! and was pleased to finish 10th overall in a time of 36:05. Steve Selley was the next Honiton runner in a time of 42:39 and was 61st overall and 2nd in his category to win a prize. The next Honiton runner was Julie Payne in 45:19 in 93rd place which meant she was the first in her category, well done Julie! She was followed by Roger Saunders in 47:49 in 133rd place who managed 3rd in his category but was a few minutes slower than his last run on this course. Michala Hudd came next at 176th place in a time of 49:53 cheered on by family and Jennie Sleeman came in at 207th place in a time of 51:11. Tony Peek took the opportunity to run this race after all his coaching the new runners and finished in 224th place in a time of 54:06. Next came Sharon Wells in a time of 53:53 in 255th place. Jo Davey was on good form at 1:00:57 in 383rd place. Wendy Williams ran with Dawn Peek who was a beginner runner and this was her first race, they finished in 407/8 places with a time of 1:02:35. Let’s hope this is the first of many for Dawn! Several Honiton Running Club members took a trip to a very windy Dawlish last Sunday to take part in Dawlish Coaster’s Oh My Obelisk race. This is an 11 mile all terrain race involving plenty of mud and hills but spectacular views. The base is Dawlish Leisure Centre and runners are taken up to the Obelisk and back down again. The winner was Arran Tocknell in a time of 1 hour 14 minutes and 8 seconds. Honiton’s Ian Stewart wasn’t too far behind coming 9th in 1:20:31. It was the first attempt at this route for most of the Honiton group and this was the case for Paul Williams. He came 51st in 1:34:45. Louise Crisp was first Honiton lady coming 128th in 1:47:59. Jim Hill had a good race to finish 170th in 1:56:10. Tony Peek has been putting in some mileage whilst training recently and came 213th in 2:09:41. Sharon Wells and Donna Stone ran this tough race together coming 229th in 2:17:56. There were 238 finishers. Shane Hudd of Honiton Running Club ran the Torrington Christmas Caper on Sunday, 21st December. A 9.8 mile course took runners along trails, through muddy tracks and fields, up hills and through a few bogs too. The well organised event started and finished at the rugby club. All runners were rewarded with a Christmas pudding and clotted cream. Shane finished 85th out of 185 runners in 1:27:42 and highly recommends this muddy fun run. On the same day several other HRC members took part in the Wellington Monument race which is just over 10k. It was a mild cloudy morning in Hemyock and the gruelling hill with 16% incline took runners up towards Simonsburrow before levelling out and circling Wellington Monument and then descending the same hill. Runners were rewarded with a mince pie, warming mulled wine and a commemorative bottle of Sheppy’s local cider. The race was won by Rowan Preece of Taunton AC in the time of 33 minutes 51 seconds and first back for Honiton was Paul Williams who came 43rd in 44:52. Mark Dallyn was next back coming 55th in 46:49 and Helen Davy finished 98th in 51:10 winning a category prize. Helen’s daughter Morgan also won a prize for 1st Under 18 female coming 122nd overall in 53:29. It was Claire Burrough’s first ever race and she did brilliantly to come 138th in 55:11. Helen’s other daughter Sasha completed the HRC contingency to come 141st in 55:19. There were 196 finishers. Well done to Steve and Ross - joint winners! Michala Hudd took part in the 10 mile Chase the Elf race from Bideford to Barnstaple along the Tarka trail last Sunday. She finished in 1:24. She didn't manage to catch the Elf but only 3 runners did! Last Saturday morning saw the Sidmouth Running Club’s Reindeer Run. This is an off road 10k race with plenty of reindeer and Santas taking part as well as the usual club and social runner. The race was won by Mike Musgrove in 39 minutes 19 seconds with Honiton Running Club’s Ben Stone coming a fantastic 3rd place in 41:17. The next Honiton runner back was Jennie Sleeman in 56:41 and 63rd place with the only other runner for the Club being Sharon Wells coming in just under the hour (59:59) and 92nd place. This is always a tough race and as usual there was plenty of slippery mud to be found. Upon their return to headquarters in Otterton, participants were treated to a delicious festive treat of a mince pie and mulled wine. There were 185 finishers. Katelyn Wells was the only Honiton junior who took part in the fun run. She had a great race finishing 3rd female and 10th overall in 16:03. There were an incredible 223 finishers. 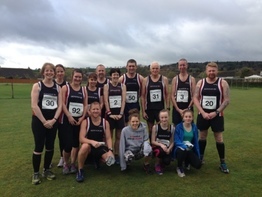 On Sunday four Honiton runners travelled to Ham Hill Country Park at Stoke Sub Hamdon, Somerset to take part in Crewkerne Running Club’s Full Monty Cute race. This is a very challenging 10 ½ mile cross country race which boasts a challenging hill for every mile. Matt Clist of Axe Valley Runners won the race in 1:12:01 with the first back for Honiton being Steve Davey who was pleased to come 56th in 1:36:44. This was about 6 minutes slower than last year which he blamed on the very slippery muddy conditions. Mark Dallyn had a fantastic race to come 67th in 1:39:27 ahead of Bruce Strawbridge who came 77th in 1:41:43. Howard Bidmead is still struggling with his fitness level following injury and he was pleased just to have been able to run it. He finished 136th in1:53:18. There were 240 finishers of this very popular race which always fills its places by October. Runners received a Christmas pudding as they crossed the line. Thanks to the marshals of both races for great support. 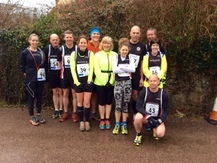 Honiton Running Club had a great turnout for the South West Road Runners’ Drogo 10 mile race last Sunday. This is a very challenging off road race with the start and finish at Castle Drogo. There are two major hills; the first coming out of Fingle Bridge and the second at the 8 mile mark up the infamous Hunters’ Path. There are breathtaking views once at the top of the hills which almost make the pain worthwhile. The race was won by Johnny Gilby in the incredible time of 57 minutes 37 seconds. Not too far behind was Honiton’s Ian Stewart who finished 19th in 1:09:45. It was Ben Stone’s first attempt at the race and he was happy to come 23rd in 1:10:14. Steve Selley had a great race even though he fell over. He finished 89th in 1:21:03 beating Steve Davey by just 3 places and 7 seconds. Paul Williams was running his first race for Honiton RC and had a fantastic race finishing right behind Steve with just 1 second splitting them. Bruce Strawbridge was next back delighted with his race coming 100th in 1:22:04 less than a minute behind the previous three. Mark Dallyn’s sore ankle held up meaning he finished 125th in 1:23:03. Richard Harris finished next in 131st place in 1:25:39. Judy Davey was the first back for the Honiton ladies to come 162nd in 1:28:59. She was followed by Pippa Westall who came 236th in 1:36:10. The other Honiton lady, Louise Crisp, came next in 250th place in 1:37:45. Jim Hill is an experienced racer but this was his first for Honiton. He last ran Drogo in 2002 when the route was a little different and he was pleased to finish 342nd in 1:47:05. Steve Briggs has moved near Plymouth and doesn’t get out to club nights so it was great to see him. He finished 370th in 1:50:24. There were 496 finishers. Honiton Running Club’s President, Alan Rowe MBE ran the Marine Corps Marathon on 26th October as part of the Allied Forces Foundation’s SideXSide Team. The AFF are the Baton’s spiritual partners in the USA and custodians of the US Baton. It was a warm day (over 70 degrees) and as usual Alan ran with the Baton and a pack of leaflets, stopping to chat to the crowd along the way about the Baton’s cause and leaving copies of the Baton’s Message of Conscience with them, this was often very emotional. Alan also ran with US servicemen and women. 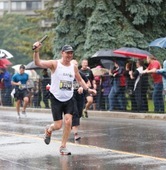 Alan also ran The Canada Army Run (half marathon) on 21st September in Ottawa. Again Alan ran with the same formula, Baton, stopping etc. The run was warm until the last quarter of the race when it poured, but the rain was so welcome - even warm itself! One sad reflection is that Alan stood on the Ottawa Memorial steps with the Navy detail 4 weeks to the day that the cowardly attack took place. On both runs the support, hospitality and organisation was incredible, Alan has already been invited back for next year’s MCM which will be the 40th - so quite special. On Sunday, 2nd November, Mark Dallyn ran the Teignbridge Trotter Templar 10 race as he was unable to do the local Yarcombe Yomp the previous day. The race is actually 9.3 miles and is multi-terrain but about a third is on road. It is based in Kingsteignton and offers runners some lovely views over the River Teign. This was a really well organised event and despite a late night the previous night, Mark was happy with the time of 1hr 12mins 42. The race was won by former Honiton RC member James Denne, now of Exeter Harriers in the time of 53:35. There were 165 finishers. On Sunday, 24th October, 3 Honiton Running Club members travelled to South Molton to take part in the South Molton Struggle which is a multi-terrain 7.8 mile run based at the Rugby Club. The weather gave lovely conditions for this well organised race. Money raised went to North Devon Hospice and the winner was Paul Cooke in a time of 47 minutes 35 seconds. Mark Dallyn was first back for Honiton coming 55th in 1:00:21 feeling much happier about his race than he had the week before. Shane and Michala Hudd had run most of the race together and Shane finished in 1:07:28 in 89th place with Michala finishing in 1:08:34 and 96th place. There were 197 finishers. 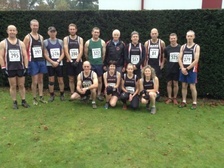 Last Saturday Honiton runners took part in the Yarcombe Yomp being the last race in the East Devon Series for the year. Runners could choose to complete one lap of 5 miles or go on for the full race of 10 miles by running the route twice. The weather was perfect and it wasn’t as muddy as it often is. The race was won by Axe Valley Runner’s Matt Clist in a new course record of 1:05:49. First back for Honiton was Ian Stewart coming 4th in 1:10:51. This was Ben Stone’s first go at this race and he came 7th in 1:13:59. Rod Inglis flew round the course to come 18th in 1:21:43 well ahead of Steve Davey who came just one place later in 1:24:40. Judy Davey was the sole Honiton lady out and she came 24th overall in1:29:28 winning a bottle of cider for coming 3rd lady. Tim Wigram completed the line-up coming 30th in 1:32:50 winning a sprint to the line with an AVR runner. There were 66 finishers although there were a few more starters! With the 10 mile race being 2 laps of the 5 mile race, it is tempting for some to finish early. Roger Saunders took this option coming 7th in the 5 mile race in 45:36. The race was won by AVR Ollie Caute who finished in 35:08 having beaten Honiton’s Iain Ross at a sprint finish. There were 26 finishers. Numbers for both races were record breaking. Upon their return to the village hall, runners were treated to delicious homemade soup and cakes. Thanks to all the organisers and landowners but special thanks to Robin Carter for another great event. Honiton Running Club members filled a mini bus heading for Minehead last Sunday to take part in the Exmoor Stagger and Stumble. The Stagger is a 16 mile off road course using the steep and varied terrain surrounding Minehead. There were plenty of spectacular views as it was a bright clear day and the race has a total ascent of 3627 ft. The route runs from Minehead to the highest point on Exmoor, Dunkery Beacon and then back to Minehead following a mixture of paths, rough terrain and tracks and both the outward and return leg involved tough climbs. James Baker won the Stagger for the 5th year running with a time of 1 hour 56 minutes and 20 seconds. Ben Stone was first back for Honiton and one of four of the Honiton contingency to take a wrong turn adding about ¼ mile to the distance. Ben finished 29th in 2:27:04. Richard Harvey was 42nd finishing in 2:37:12 with Alasdair Moffett one place and 20 seconds behind with Alasdair taking in the added distance. Steve Davey was next back in 51st place in 2:40:16 closely followed by Bruce Strawbridge who finished 60th in 2:43:10. Judy Davey was the first Honiton lady back and also took the wrong turn. She was 68th in 2:46:44. Mark Dallyn finished next in 93rd place in 2:59:21 and Esme Moffett also went wrong and finished 107th in 3:03:18. There were 175 finishers. Runners had the choice of tackling the much shorter Stumble race which is 6.8 miles long. Although not taking runners to Dunkery Beacon, it is still a testing course. Anthony Vangasse won the race in 46:57. Howard Bidmead was first back for Honiton winning his age category and coming 22nd in 1:00:18. Richard Harris had been overtaken by Howard just before the finish line and had to be content to finish 1 place and just 4 seconds later. Pippa Westall was first Honiton lady home in that race coming 39th in 1:05:55. Juliet Hall and Clare Melbourne ran together to complete the Honiton contingent coming 75th and 76th with Juliet 1:21:03 and Clare 9 seconds later. There were 90 finishers. Three Honiton runners took part in the second running of the Herepath Half which follows the Staple Fitzpaine Herepath Trail in the Blackdown Hills and is approximately 13.7 miles long. The trail reaches the highest point in the Blackdowns with fabulous views. Herepaths were originally important trade and communication routes between settlements during the ninth century - they are often referred to as people’s paths. The race was won by Tom Mellor of Hydrographic Harriers in a time of 1:34:31. Ben Stone was first back for Honiton coming 7th in 1:43:13. Bruce Strawbridge was next back coming 25th in 1:51:58 having thoroughly enjoyed the route. Tim Wigram was the final Honiton runner finishing 56th in 2:09:19. There were 145 finishers. Honiton RC member Katy Campbell recently won a competition run by 220 Triathlon magazine to be mentored by four time Ironman world champion and world record holder Chrissie Wellington. After saying for years that she would never dabble in triathlon due to her hatred of swimming, Katy finally took the plunge to raise money for Bristol-based St Peter's hospice after her good friend Laura was diagnosed with cancer. She was well and truly hooked after her first event, so when the competition was advertised, it seemed like too good an opportunity to miss. Katy now has Chrissie on speed dial, and regularly meets up with her and a qualified triathlon coach on a regular basis, often with a photographer and magazine editor in attendance! As well as expert advice and the odd freebie, it's providing Katy with added confidence and inspiration, and certainly helped her round her first Olympic distance event at Dorney Lake a couple of weeks ago. She's now planning a tribute to Laura, who sadly died on Boxing Day last year, by entering a trio of events based around the places she lived. This will involve the Edinburgh half marathon in May, the Bristol triathlon in June and then the Alpe d'Huez triathlon in July, which incorporates the famous Tour de France climb amongst others! Katy will be continuing to raise money for St Peter's Hospice, so if you would like to help, please visit her justgiving site: http://justgiving.com/triathlonforlaura. You can also follow her story in blog form: http://mrskatycampbell.wordpress.com and on twitter: @mrskatycampbell. 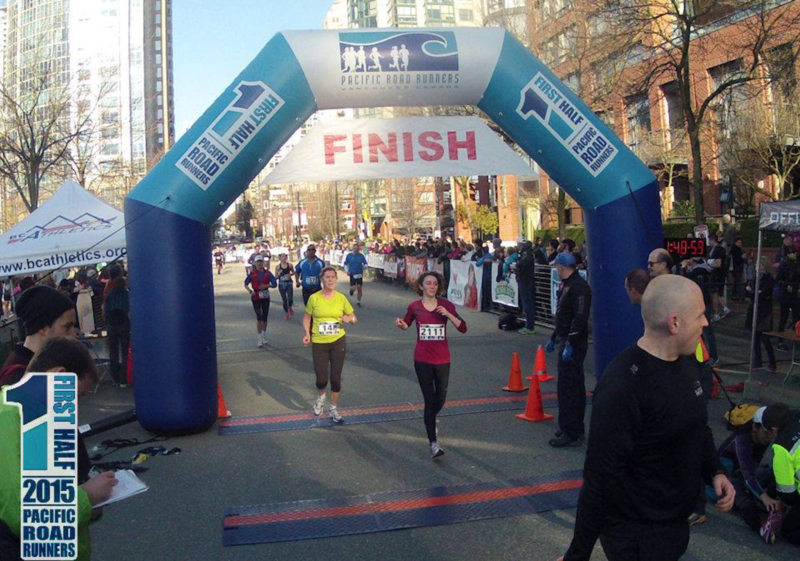 Helen Saunders a beginner runner in January completed a 10K race in 48:38 having moved to Vancouver. The run was around Stanley Park complete with totem poles. The Canadian way of life is obviously suiting her. Mon-Wed nights meet at 6:30 at Honiton Community College to share cars unless driving direct to venue. M/T run from Farway Village Hall. Meet at 6.40pm at Hall or Honiton Community College at 6.30pm to share lifts. Newton Poppleford. Meet at 6.45pm at car park in Newton Poppleford - see map 17 on website under ‘news’ and ‘maps and routes’ for full details. Or meet at HCC at 6.30pm to share cars.